Gold N Tulip is out of our great JP Grand Tulip who is over 90" at 8 yrs old. Exposed to ZD Rapid Fire for a calf with two great 90" Grandmothers. 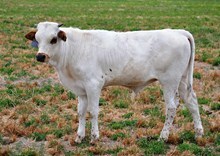 Consigned to the Midwest Sale in Kansas in April.